Bishop Giovanni authorised Giotto Monaldi to establish a Cistercian nunnery here in 1218. 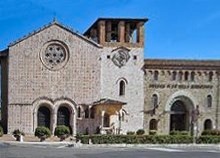 It housed one of the first communities to follow the rule for “poor cloistered ladies” that Cardinal Ugolino established in 1219, and Pope Honorius III took it under direct papal control in 1222. As Pope Gregory IX, Cardinal Ugolino granted the nuns a “privilege of poverty” in 1229. However, their total dependence on alms soon proved to be impractical and he made them accept an endowment of property in 1231 in order to provide them with an income. The modification of the Rule in 1247 by Pope Innocent IV established the Franciscan character of the developing order, which subsequently became known as the Order of St Clare. In 1253, Innocent IV consecrated the nuns’ new church as Santa Maria Assunta. The community enjoyed a series of papal privileges in the 13th century, and grew in wealth and prestige. However, its moral standing subsequently declined, as did its size. By 1448, when only 16 nuns remained, another 23 nuns were sent from Santa Lucia, Foligno in order to reform and revitalise the community under the direction of the Observant Franciscan, Fra. John of Capistrano. The friars of the Convento di Monteripido subsequently provided spiritual guidance for the nuns, and encouraged them to set up their scriptorium in 1448. ✴In 1451, the nearby nunnery of San Paolo del Favarone was placed under their authority. ✴Also in 1451, nuns from Santa Maria di Monteluce and others from Santa Lucia, Foligno were sent to reform the community of SS Cosmo e Damiano in Mica Aurea, Rome. ✴In 1477, nuns from the community were sent to reform the community of Santa Maria di Vallegloria, Spello. ✴Sister Eufrasia (Emilia Alfani) was abbess on several occasions. She began the “Memoriale di Santa Maria di Monteluce”, drawing on written records and on the memories of the older nuns. She died in ca. 1490. ✴Her sister, Sister Battista (Antonia Alfani) originally took vows as a tertiary at Sant’ Antonio da Padova, but transferred to Santa Maria di Monteluce in 1452. She was named as abbess in 1491, 1496 and 1503. She completed the “Memoriale di Santa Maria di Monteluce” and wrote other works that included a biography of St Clare. She died in 1523. ✴Their cousin and sister-in-law, Sister Francescacherubina (Francesca di Fortera Baglioni, the wife of Giovanbattista di Alfono Alfani and sister of Bishop Giovanni Andrea Baglioni) entered the nunnery in 1484 after the death of her husband. She died in 1507. In 1521, nuns from the community were sent to establish a new community of Poor Clares at what had been the Benedictine nunnery of San Ponziano, Spoleto. In 1526, , four nuns from the community reformed the nunnery in Città di Castello that became Santa Chiara delle Murate. The Franciscan tertiaries of Sant’ Antonio da Padova left their nunnery for a few months in 1571, when Pope Pius V imposed clausura on all female religious communities. They relented in the following year, and from this point seem to have become dependent upon Santa Maria di Monteluce. The nuns from Santa Maria di Monteluce took refuge at Sant’ Antonio da Padova in 1643 when their nunnery was threatened during the war between Pope Urban VIII and Grand Duke Ferdinand II of Tuscany. The nunnery began its decline in 1703, when it was placed under episcopal jurisdiction. The nuns of Sant’ Agnese took refuge at Monteluce during the French occupation in 1810, returning to their own nunnery in 1816. The nuns from Santa Giuliana joined the community at Monteluce in ca. 1862. The nunnery, which is to the right of the church, was commandeered for the hospital in 1927 and the nuns moved to Sant' Erminio. The hospital here, which absorbed the Ospedale di Santa Maria della Misericordia 1923, closed in 2008. The area is now the subject of ambitious development plans. The church remains in use and is usually open to visitors. Santa Maria di Monteluce: Main page Church Nuns’ choir Art from church. Return to Nunneries of Perugia.